The cottage is ideally placed in the village of Broadford as it is within easy walking distance of local pubs, eating places, shops and restaurants, while it is set in its own private garden grounds. It has ample parking. It is located some 1/4mile from the A87. 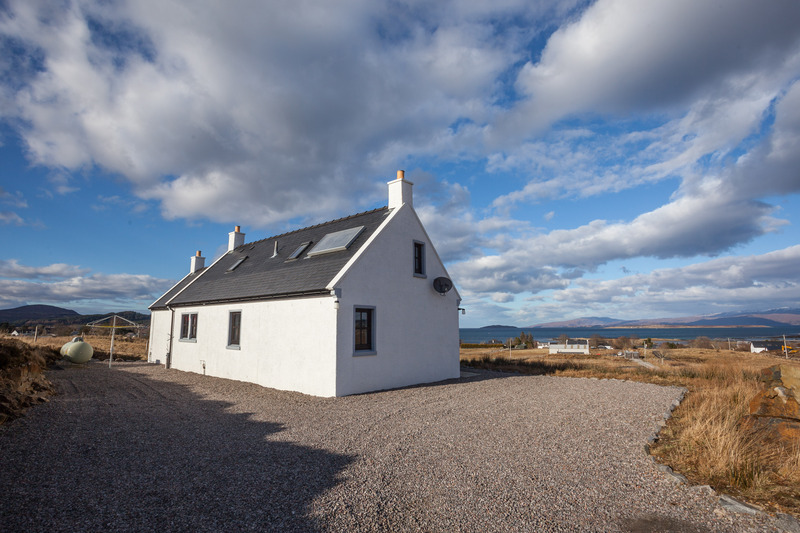 It enjoys superb open views over Broadford Bay to the magical Island of Pabay, with the heights of Applecross in the background and the Islands of Scalpay, Longay, Crowlins and Guillamon scattered across the waters leading to the mystical Islands of Raasay and Rona, which can be seen to the north. Boating activities at Broadford Pier can be viewed across the Bay, as can magnificent sunsets. Broadford (in Gaelic “An t-Ath Leathann” pronounced Un Taa Layun means “the broad ford”) was formerly a cattle market up until the 19th century and in 1812 Thomas Telford built a road through the village. It then grew rapidly in the first half of the 19th century with the settlement of Napoleonic veterans. It is the second largest village on Skye and a perfect base from which to explore the island and near mainland as it is ideally placed between the spectacular Red Cuillin and the mainland Torridon mountains. Whether you decide to eat in, or you choose to eat out, there is plenty of choice nearby. Broadford has a supermarket and a range of small shops, and you will find a list of convenient eating places in the cottage handbook – these range from a Michelin Star restaurant (within 3 miles) to a take-away fish and chip shop, plus local restaurants and pubs (within 1 mile).